A group of fighters well past their prime look to step into the spotlight one more time to do what they know best: fight. We followed Royce Gracie, Ken Shamrock and Dada 5000 for one day as they prepared for Bellator 149.
he company's official title is Bellator MMA -- but it's known for blurring the line on what exactly constitutes mixed martial arts. That much will be clear on Friday, during Bellator's "tent-pole" nationally televised event at Toyota Center in Houston. Bellator 149 will feature two former legends (now with a combined age of 101), an Internet backyard-brawling sensation turned pro fighter and ... well, a Dada 5000. MMA founding fathers Royce Gracie, 49, and Ken Shamrock, 52, will meet in Friday's main event. Gracie hasn't fought since 2007. Shamrock came out of a five-year retirement last year. It will mark the third time they have shared a cage, as they squared off at UFC 1 in 1993 and again at UFC 5 in 1995. To this day, Shamrock remains bitter about his 0-1-1 record in those meetings. In the co-main, Kimbo Slice, 42, will meet Dhafir "Dada 5000" Harris, 38, a former high school friend turned foe who claims he should have received a similar level of notoriety as Slice -- but was held back by the same management group that built up Slice. Whether you consider these contests professional MMA or not, they fit the Bellator business model: Give viewers something they want to watch. When Scott Coker accepted the role of president at Bellator MMA in 2014, he remembers shortly after asking his son if he intended to watch an MMA event over the weekend. His son answered that he was over MMA. There were no names left. Coker asked, "Who would you want to see fight?" The answer wasn't anyone ranked in the top 10 of his weight class. It was Kimbo Slice. Nearly two years later, Coker is giving his son -- and the casual viewing audience he represents -- what he wants. And the four men involved are more than happy to be in the spotlight. Three of the four fighters featured on Friday's card, with an average age of 46, agreed to let ESPN cameras follow them around for the day on Feb. 10, just nine days before Bellator 149. The result is a behind-the-scenes look at the path each fighter has taken in order to prepare for one more shot at glory. Ken Shamrock, an MMA pioneer who began fighting professionally in 1993, adds honey to his bowl of oatmeal while eating breakfast in Dallas. Shamrock and two of his sons have been staying at a friend's home for nearly two months during training camp. Shamrock's son Ryan cooks his father's oatmeal every morning before he wakes up. Early morning rituals start at 7 for 49-year-old Royce Gracie at his home in Palos Verdes Estates, California, just outside of Los Angeles. The UFC legend begins with shaving and taking his daughter to school before starting a rigorous training schedule. Gracie, considered by UFC fans to be the most influential figure in the history of modern MMA, first gained recognition by winning one-night tournaments at three of the first four UFC events. Gracie, who hasn't fought professionally since 2007, trains with Yoshi Hisataka, right, at The Yard gym in Los Angeles. Dhafir Harris, a street-fighting promoter better known as "Dada 5,000," he first gained notoriety in the documentary "Dawg Fight." Harris, also known for his colorful hairstyle, peels boiled eggs he prepared for breakfast in the kitchen of his house in Perrine, Florida. He ate six hard-boiled egg whites on this day, as he trains for his fight with fellow Miami-based backyard fighter Kimbo Slice. In reference to his training Harris says, "The ring in my backyard is a symbol of where I come from, a symbol of the darkness, the death, and the destruction." After eating breakfast at the house, Shamrock went back to sleep for two hours before packing up and heading to the gym with his two sons. Shamrock wrapped his hands for a cardio workout and striking session with coach Guy Mezger, who fought on the same UFC 5 card in 1995 as Shamrock. Mezger was a member of Shamrock's gym, Lion's Den, and recently reconnected with him to help him train for this trilogy fight. "King" Mike Phillips, left, a fighter with Harris' Back Yard Brawl promotion, and Jose Rivera relax in the living room of Harris' home as he eats his egg whites. Rivera, who serves as Harris' "IT man," first met him while working as the neighborhood ice cream man. Harris' mother, Ellen Stewart, who lives with him, has someone on the phone who wants to talk with him. Shamrock works on kicks with his son Sean holding pads while Mezger and Shamrock's son Ryan look on from outside the cage. For Shamrock, this camp has been a family affair, with Sean working as one of his training partners and Ryan preparing his meals and helping schedule the day-to-day routines while the three share a house in Dallas. Gracie's son Kheydon, 13, left, ditches school and naps in the back seat as his father navigates his way through heavy Los Angeles traffic on his way to The Yard to train for the fight. Gracie defeated Shamrock, a fellow UFC Hall of Famer, by submission in just 57 seconds during their first fight at UFC 1. Shamrock, who is just 2-8 over his past 10 fights dating back to 2005, looks at the designs for his fight shorts at his gym while sons Sean and Ryan look up restaurants located near his eye doctor. After his breakfast of hard-boiled egg whites, Dada gets a fresh cup of spicy conch salad from Jojo Harmon, who sells it out of the trunk of his car in Harris' neighborhood. Harris has just two professional MMA bouts under his belt and hasn't fought since 2011. Shamrock, who has fought just one time since 2010, when he was knocked out by Kimbo Slice last June, packs up his belongings after his training session while his two sons look on. The trio will then rush across town to grab a bite to eat before heading to Shamrock's eye appointment. Gracie, whose only loss in UFC competition came in 2006 against Matt Hughes, trains with longtime friend James Strom during a workout at the Royce Gracie Jiu-Jitsu Academy in Torrance, California. Gracie's gym is known as one of the largest martial arts schools in the country. Shamrock, who took multiple breaks from his MMA career in order to pursue memorable runs as a pro wrestler, takes a break between rounds during a training session. In his much-anticipated rematch with Gracie at UFC 5, Shamrock was forced to settle for a draw after 36 minutes during an era of MMA that predated judges and rounds. Trainer Tony Suarez looks on as Dada 5000 stretches before his workout in the ring with striking coach Freddie "The Rock" Delgado. Harris, who makes no bones about his intention to brawl Slice, has won both of his professional fights by knockout. Harris works on his punching with head coach Ervin Steel as he prepares for his showdown with rival Slice. "I've got bad intentions towards this guy. I'm swinging with nothing but blunt-force trauma. I'm going to push him out to deep water and make him walk the plank like a pirate," said Harris. "He has never fought anyone that wasn't afraid of him. When he fights me, he's fighting my anger, my soul and my beliefs." Looking to shake off the rust of more than eight years, Gracie spends time at his gym stretching out his body in preparation for his bout with Shamrock. Like their first two meetings in the days before weight classes in the UFC, Friday's bout at Bellator 149 will be contested at open weight, with Shamrock expected to enter with a significant weight advantage. Shamrock laughs when the nurse asks if he had ever had surgery, to which he responds, "Plenty." He broke his neck when he was in high school, forcing him to undergo neck surgery, which doctors said would keep him out of athletics for the rest of his life. He went on to play college football and become a legend in the world of MMA -- with several other surgeries along the way. Gracie stands up to his waist for several minutes in their family pool, icing his legs and spine after a strenuous day of training and sparring. He is greeted by his 10-year-old daughter, Kharianna, who has just returned home from school and music lessons. Dada 5000 works with a dummy in the ring with Steel. "He's strong enough to beat Kimbo, and there's bad blood between the two of them. Bad blood can be an adrenaline and you just start doing things you didn't know you could do. You might see some crazy s--- in the fight. I'm not saying we're going to break the rules, but we're going to come close," said Steel. Gracie applies heat to his body in the hot tub outside his home immediately after icing his legs and spine in the pool. Throughout Gracie's professional career, 12 of his 14 wins came via submission. Dada 5000 gets his hair trimmed by his barber, Virgil Jackson, at MVP Barber Shop in Miami. Jackson has been cutting the heavyweight's hair for years. "We both come from the backyard," Jackson said. As far as Harris' unique hair style, Jackson added, "It's Dada's design, I just keep it trimmed and looking good." Harris smiles as he greets Shaquandria Shedrick and Angela Roberts, owners of one of his favorite restaurant, ChickNWings. Dada ordered their best-selling lemon pepper wings with French fries as he closes in on fight night against rival and fellow Miami native Kimbo Slice. After the eye exam, Shamrock and his sons go back to their house in Dallas, where the 52-year-old fighter takes a nap while Sean and Ryan watch a movie in the living room. After waking from his slumber, Shamrock raids the fridge for his dinner, which ends up being a large portion of pasta and two chicken breasts. Patrick D. Fowler-Reida, a doctor who specializes in the treatment of the spine, skeletal, muscle and nervous system, works on Gracie at his office in San Pedro, California. Gracie, 49, has been a patient and friend for the past 20 years, and needed work on his body after a hard day of training. 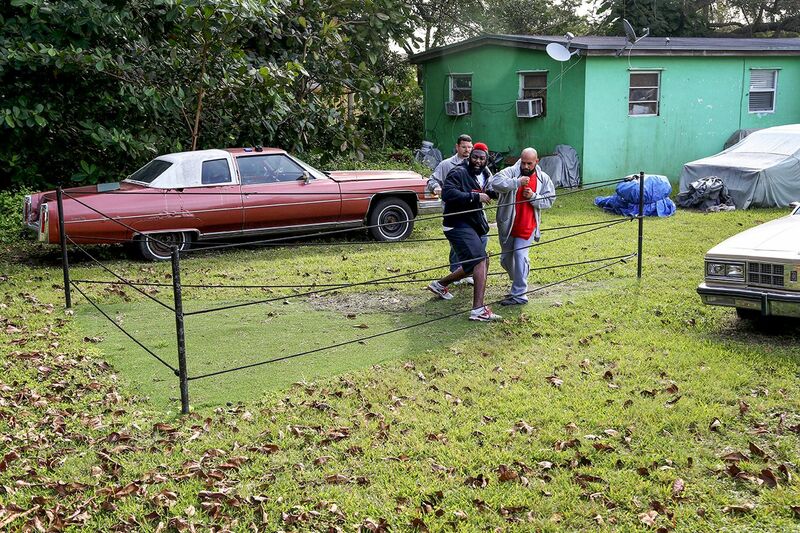 At the end of the night, Dada 5000 heads back into the tiny green house with the infamous yard. "I'm a real spiritual person, but I stay away from discussing religion, sexuality and politics. I don't have a heaven or hell to put anyone in. Who am I to enforce my beliefs on anyone? My reality is not your reality," he said. Gracie's son Khor, left, a 17-year-old high school senior, helps his father prepare venison burgers for dinner in the kitchen of their home. The meat was collected from a recent deer hunting trip in Kentucky. After dinner, Shamrock takes his third extended nap of the day (fourth if you count the cat nap at the eye doctor) before waking up to video chat with his wife and grandkids. He then gives a few late-night interviews to the media on the West Coast. While he's away for an extended period of time during training, Shamrock makes speaking with his family a top priority. Gracie and his family relax in the living room of their home after dinner before retiring for the night. Khonry, 18, left, his sister Kharianna, 10, center, spend time with their father and neighbor Joey Johnson, right. Kharianna, who is a dancer, gets an ice wrap applied around a sore ankle by her father. Her mother, Dr. Marianne Cuttic, is a podiatrist and is working this week in her office in Mammoth Lakes, which is more than 300 miles away. Shamrock sits alone in the movie theater catching a late film. He and his father used to go to the movies regularly as a child, and going to see a movie now gives Shamrock a little slice of home no matter where in the world he is.